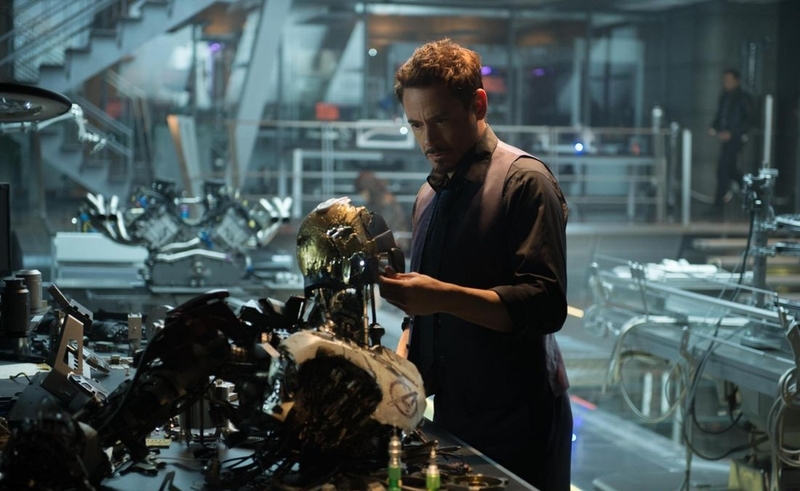 Avengers: Age Of Ultron wastes no time getting started. Opening with a long, unbroken shot that follows first one Avenger, then another, then all of them together as they race through the forest outside an Eastern European fortress in the fictional, war-torn country of Sokovia, it moves as if unburdened by the need to explain everything. The first Avengers film had to set up a fairly elaborate plot while putting all the players into place and introducing them to one another—and sometimes the audience, given that Black Widow (Scarlett Johansson) and Hawkeye (Jeremy Renner) had only had cameos in previous films, and Bruce Banner was now played by Mark Ruffalo instead of Edward Norton. Avengers: Age Of Ultron doesn’t have to worry about that, nor does it feel the need to spend too much time explaining the status quo of the Marvel Cinematic Universe as the film opens. The script assumes viewers know what happened in the last movie, what’s up with S.H.I.E.L.D., and so on. In a sense, this is the movie Marvel Studios has been training audiences to watch over the course of the 10 previous movies. Yet the way it plays off the accumulated knowledge of all those earlier adventures matters a lot less than the way returning writer-director Joss Whedon uses previous developements as tools with which to build a story about heroism, teamwork, the persistence of ideals in the face of despair—and the fragility of all of the above. The Avengers begin the film in a good place, working together to bring down the bad guys and playing off each other’s strengths. They don’t stay in that good place, but Whedon lets viewers share the team’s pleasure as they conduct the opening raid on a HYDRA base with power, precision, and more than a little affectionate esprit de corps. That continues after the appearance of Wanda (Elizabeth Olsen) and Pietro Maximoff (Aaron Taylor-Johnson), a pair of super-powered Sokovian twins with a grudge against Tony Stark (Robert Downey Jr.). Wanda has the ability to cloud minds and otherwise alter reality; Pietro moves faster than any human alive. They both evolve from credible threats to some of the most powerful beings on the planet to allies over the course of the film. But even though comics readers know they’re destined to join the good guys, Whedon doesn’t send them there via an easy route, or undersell their reluctance to join a team funded by and featuring a weapons merchant partly responsible for turning their country into a hellhole. But Whedon’s handling of the personal material is what makes Age Of Ultron extraordinary. Remarkably for a film so overstuffed, no character gets neglected. Not only does Age Of Ultron get a charge from the unexpected pairing of characters with seemingly nothing in common, but Hawkeye, a character easily relegated to the margins, emerges as the team’s heart. As with the best Avengers comics, the scenes of the group simply interacting—taking digs at one another, trying to lift Thor’s hammer, flirting—are as entertaining as those of heroes in action. That’s thanks in part to Whedon’s clever dialogue, which gets more of a spotlight than in the first Avengers film, and to the actors, who take every opportunity to plumb beneath the surface of their characters. It helps that the movie keeps giving them opportunities, too. Mid-film, under Wanda’s spell, most of the Avengers confront their worst fears in a series of fantasy sequences that might feel indulgent in a lesser movie, particularly one with such a generous running time, but here provides much welcome shading to the tights and capes. If anything, Age Of Ultron plays as if it occasionally has to sacrifice exposition for such character moments, with a few developments remaining underexplained, though not incoherent. Whedon is as interested in how the team works—and how it threatens to fall apart—under stress as he is in the way pavement cracks under the collective weight of the Hulk and Stark’s Hulkbuster armor. Each character has a unique gift, but also unique burdens that threaten the ability to exercise those gifts. They’re thoroughly human superhumans, and a payoff emphasizing their vulnerabilities and doubts helps make Age Of Ultron one of the most emotionally satisfying superhero films of our superhero-film-thick age, as well as one of the most exciting. As easy as the Avengers make the business of being a hero look in the film’s opening scenes, the movie is ultimately about the hard work needed to do what’s right in a world that doesn’t make that any easier, for the extraordinary and the ordinary alike.